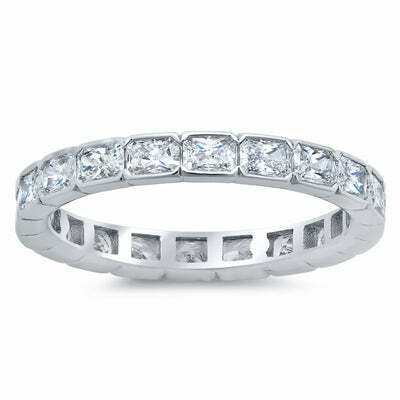 East west engagement rings and wedding rings are really popular. An east west setting is referring to the diamond going across your finger (left and right) vs up and down your finger (the more traditional setting). It’s funny because years ago, I’m talking 1991 maybe, I was shopping with my mom and the sales associate had a gorgeous emerald cut diamond solitaire engagement ring with the diamond set across her finger, east west. I remember thinking how unique it looked and mentioning it to her. At the age of 12, I had never noticed a ring like this before and it really struck me. Fast-forward years later, and my wedding ring is east west. Of course I had to choose my own wedding band! LOL! 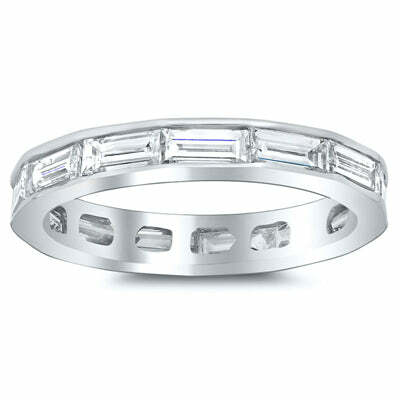 I love this east west ring with radiant cut diamonds. Not only is it unique, but since it’s a channel style setting, it’s smooth and is great for wearing every day. It’s also great for stacking alongside some other rings. This engagement ring is an east west design and even though it’s shown with an oval in the main picture, we can set other diamonds also this same way. 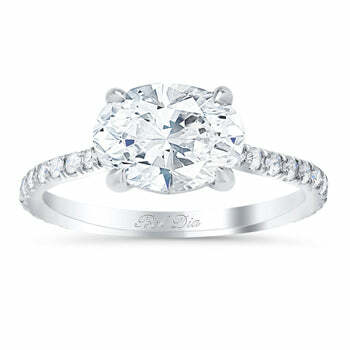 Can you imagine how pretty a marquise diamond would look in this setting going across your finger? With so many women wearing stackable rings these days, one should consider adding this east west baguette ring to their set. I love channel set bands and this ring does not disappoint. When shopping for your engagement ring or wedding band, be sure to consider an east-west design. It’s a unique look and you’ll get lots of compliments. However, if you still want to go more traditional on your engagement ring, you can still always consider going east west for your wedding ring.